Over the last few years, there has been increasing talk about the potential of agriculture as a market for robotics. Speaking about future markets for unmanned aerial systems in a recent presentation at Maker Faire, DIY Drones founder and CEO of 3D Robotics Chris Anderson characterized agriculture as the “biggest economic potential with the lowest regulatory barriers,” and talked about the important role they can play in supplying much needed data to farmers, stating that “agriculture is a big data problem without the big data.” One of the slides he showed in that presentation was a chart, created by AUVSI, projecting the market for unmanned aerial systems through 2025, and predicting that sales into agriculture will dwarf all other applications combined. For their part, AUVSI devoted the Spring 2012 issue of its online publication Mission Critical to agriculture, and will be doing so again with its upcoming August 2013 issue. The Distributed Robotics Garden, a project of the Distributed Robotics Laboratory, CSAIL, MIT. There’s much more to agricultural robotics than aerial systems, of course. There are already GPS-guided auto-steering systems on the ground that, when installed on tractors, assure complete coverage of fields with a minimum of overlap from one pass to the next while relieving stress on the generally still-present human operators they may one day replace. This same technology is finding its way into combine harvesters and other large, self-propelled equipment, enabling them to complete their tasks more quickly, using less fuel and reducing waste. Application of chemicals metered according to need will further reduce waste, and robotic planters are already producing more even stands using less seed. In milking parlors, robots are taking over the tedious, noisome, and somewhat dangerous job of milking cows. Robots that tend vineyards and orchards, pruning and mowing between vines and picking apples, are either already available or well along in their development. Moreover, under pressure from labor shortages, efforts are underway to mechanize or automate labor-intensive aspects of the production and handling of a wide range of speciality crops, from asparagus to strawberries, if not in the field then in preparing the produce for shipment. The robotic control of heavy equipment in field operations: This is essentially an extrapolation of what’s happening at present, but executed with greater precision. Robotic replacement for hand labor: The level of detail required in mapping and manipulation the environment opens the possibility of a new, robotics-intensive approach, initially enabling better practices in the raising of speciality crops, but eventually scaling to replace the methods currently used on large acreages. This robotics-intensive approach is a scenario that involves both significant investment and significant disruption as it scales upward to larger areas and staple crops with thinner margins. The simple extrapolation approach doesn’t alter the fundamental nature of agriculture as it is commonly practiced. It treats robotics as an add-on or substitute rather than as a transformative opportunity. The obvious risks, involving investment in engineering and in purchasing equipment, while significant for those immediately involved, are finite, estimable, and almost entirely financial in nature. The rewards are similarly modest: for equipment manufacturers, it amounts to keeping up with competitors; for farmers, there may be a slight improvement in margins and maybe a little more time to spend not sitting on a tractor. Cultibotics — or robotic gardening — leverages robotics in order to transform current agricultural practice. The hidden risks with this approach are longer term, and relate to the perpetuation of agriculture as currently practiced, with all of the environmental and nutritional problems that implies. A robotic tractor is still a tractor, compressing the soil over which it passes, necessitating tillage to re-loosen it, consuming energy and exposing the soil to erosion and accelerated mineralization, and reducing its ability to supply nutrients to plants and its ability to absorb and retain water. With a rising human population and finite arable land, the risks of using this approach include the possibility of widespread malnutrition and more frequent famine. The robotics-intensive approach, which I like to term Cultibotics, but which I’ll simply refer to as ‘robotic gardening’ here, leverages robotics in order to transform current agricultural practice. To accomplish this, the machinery must become autonomous so that a single farmer can oversee the simultaneous operation of many machines. The one-to-one correspondence between operator and machine has driven the increasing size and power of tractors and other machinery, and breaking that correspondence is a necessary first step toward a robotics-intensive approach. Given autonomous machines, and the resulting possibility of operating many of them, the use of much smaller, lighter machines becomes an option. 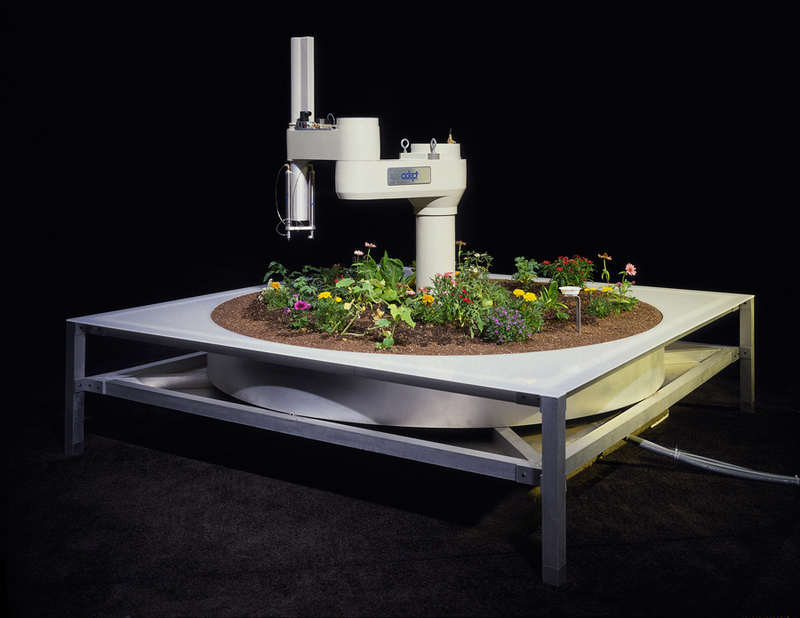 If these machines are also capable of dextrous or otherwise detailed manipulation, an altogether different approach to agriculture becomes possible: one based on the best practices of gardening, applied on a grand scale. If you’re having trouble imagining what I’m referring to here, consider the Telegarden. The Telegarden wasn’t autonomous; rather it was remotely operated by many people in succession. It also wasn’t light or mobile, as it used a pivoting industrial robotic arm to perform all operations. It wasn’t even a particularly serious attempt at gardening, since there was no overall design or production goals driving the planting decisions. What it did was to demonstrate that a robot can perform the physical tasks necessary to maintain a garden. Gardening robots could come in various sizes, some larger and some smaller, could be mobile, and could operate autonomously under the direction of a coordinating system, itself guided by a plan created by the gardener or farmer. Because they could do their work in a detailed fashion, planting one seed at a time, or pulling one weed at a time, instead of moving soil around in bulk, and because they could have the luxury of operating continuously (24/7 if need be) instead of having to race to get the job done quickly, their power requirements would be modest — well within the bounds of what could be supplied by device-mounted solar arrays and/or on-site wind generators — and the need for energy storage could be minimized by saving operations requiring less power for the nighttime. Some of this technology is already in development, but the preponderance of the work remains to be done, which is to say that there are still many ‘ground floor’ opportunities available: designing gardening techniques suitable to robots, developing hardware to perform those techniques and platforms upon which to mount that hardware, and software to drive it all, both at the device level and for the coordinating system. 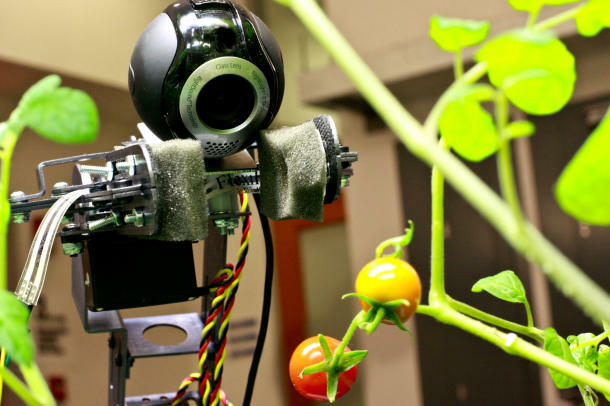 The Telegarden demonstrated that a robot can perform the physical tasks necessary to maintain a garden. Obviously there are risks in this scenario as well: the cost and time required to develop the technology, and then additional time to ramp up production and gradually replace existing equipment. By the time this has been done, some other solution, perhaps the cultivation of algae in water-filled glass tubes, might be well on its way to replacing agriculture altogether. There’s also the risk that only a small percentage of farmers will be willing to give up familiar practices to take advantage of the new technology and the new approach it enables, and a risk that some corporations will choose to resist the change rather than adapt to it. The benefits, on the other hand, potentially include: the transformation of a monoculture-dominated landscape into a huge garden; reduced reliance on petroleum-based products; improved diets through the extension of mechanization to crops like tomatoes, peppers, strawberries, etc. (making them more affordable); dramatically reduced loss of soil to erosion; reduction of agriculture’s contribution to CO2 production and reversal of the loss of soil carbon, helping to soak up some of the extra CO2 already in the atmosphere; increased system resilience for a more robust response to climate change; and increased respect, and a far more interesting livelihood, for farmers. For the companies and investors who take the financial risks to bring this about, because much of the savings in reduced fuel and chemical use become available for equipment purchases, there is the potential for a huge payoff. For society at large, there’s also the economic stimulus of a new industry, one with the subtlety to bring technology to bear in the service of soil fertility, sustainability, and biodiversity, as well as the production of food and other plant-sourced products.